As you may know by now I love myself a good eBay find and in the past year it's been my personal mission to find some bargain makeup brush sets. With Spectrum, Artis and Zoeva releasing some gorgeous collections lately but all with fairly large price tags, my aim was to seek out similar styles for a snip of the cost without compromising on quality. And I think I've gone and done it! Yes, amazingly all the brush sets in this post cost under £6 with free p&p! Pretty amazing if you ask me. The only thing I would say it that delivery does take some time, around 2-3 weeks but they are all more than worth the wait. 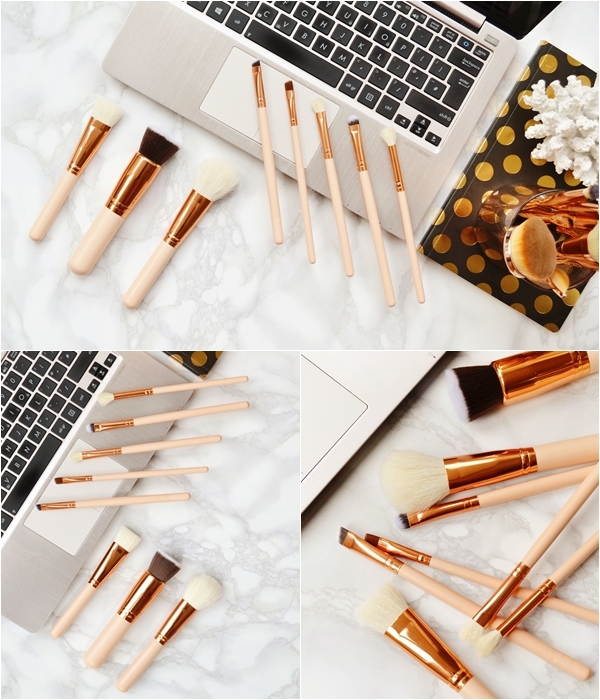 This is the set I'm most excited to show you as it looks incredibly similar to the stunning Zoeva Rose Golden Brush Set without being a fake and including any branding... you also receive EIGHT brushes here for under £5 - such a bargain! The set comprises of 3 face brushes and 5 eye brushes similar to the Zoeva set, all with sturdy rose gold ferrules and powder pink wooden handles. I've already been using this set a huge amount in the past two weeks and have found the foundation buffing brush to be one of my favourites as it's perfectly soft yet structured, along with the eye smudger brush, crease brush and eyebrow brush, all of which are amazing quality. As I already own a few Zoeva eye brushes I can compare the quality and say they are very similar indeed, so much so that's it's satisfied my need to buy the rose gold set from Zoeva. These have already had two washes so far and have had minimal shedding which I'm really impressed by. Overall I'm so pleased I came across these brushes and wouldn't hesitate in recommending them! On to an equally stunning set that again I can't get enough of and one I'm incredibly glad I picked up as the stock images just don't do the brushes justice. 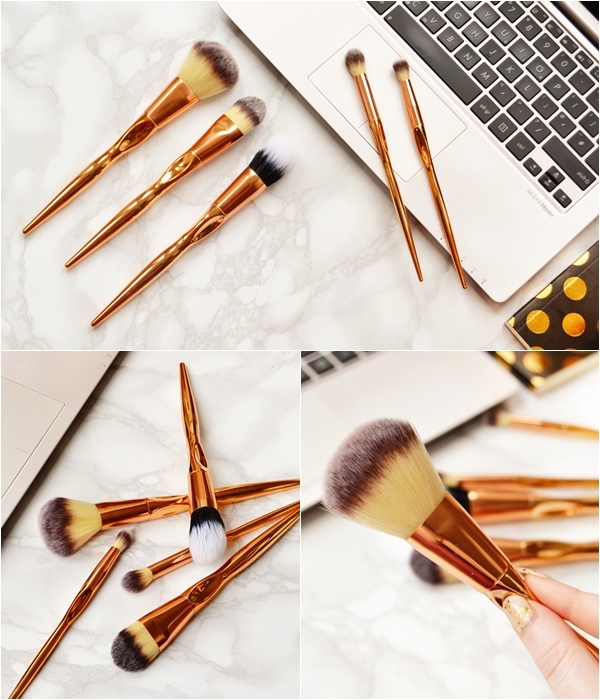 Included in the set at three face brushes and two eyeshadow brushes, one of which could be used for highlighter. What I love most about these brushes other than how aesthetically pleasing they are is the design/shape of the brushes that allows you to hold them in the correct way, which remind me of the Real Techniques Bold Metal brushes. This especially helps if you are often heavy handed when applying makeup or still haven't mastered eyeshadow blending fully. I really can't pick a favourite brush from this set as they're all incredibly soft and well made. As for shedding I've found only the foundation brush to shed which isn't such a big deal. Another amazing set for the price! All brushes can be purchased individually for £1.29 each in the listing as well! Last but certainly not least possibly the brush set with the largest saving if you compare them to the very similar rose gold oval Iconic London brushes. With two other amazing brush sets in this post it's hard to say that these may just be my favourites but they certainly are impressive and such amazing quality. 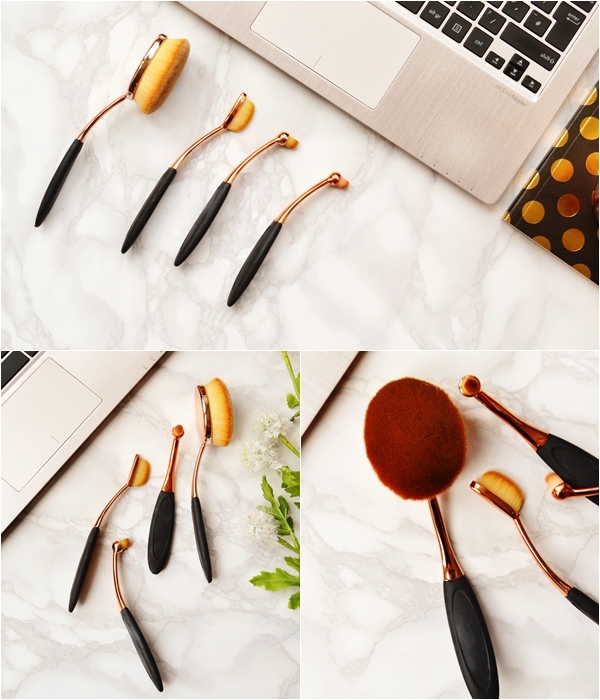 Included in the set are three face brushes and two eye brushes however they are all very multi-purpose especially the smaller brushes and can also be used on the lips and face. Other than the stunning professional look to the brushes I love how incredibly soft yet dense they are - the large brush really must contain hundreds of thousands of fibres. This does mean you do need to thoroughly wash each brush however it also means they give such a professional blended finish. As for favourites I love using the smallest brush to apply matte lip creams as it gives such a perfect application and the large blending brush is amazing for finishing foundation off with to give a seamless airbrushed effect. Yes, oval brushes do require some getting use to but once you get the hang of how to use them in that sweeping motion (YouTube videos help!) they really are amazing and this set really does feel professional. Again all brushes can be purchased individually for £1.14-£2.96 in a separate listing here. I really do hope I've saved you money if you've been lusting after a more expensive rose gold brush set or I've enabled you to buy more brushes you really don't need mwahaha!